Last Spring, I spent a few weeks with my right arm in a sling then about 6 weeks of physical therapy. During this period, I spent a lot of time reading, especially the writings and statements of Philip Guston and his friend Morton Feldman. It was fascinating to note that Guston's views never changed much, even when he made the "shocking" break from abstraction to figuration. I was drawn to his use of a limited amount of everyday objects and their placement on the canvas. Watching film of Guston at work also inspired me to be more direct in my painting, getting it down quickly. Guston was described as the best read high school drop out ever. 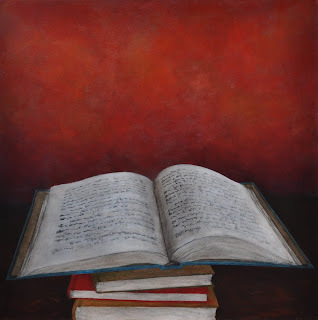 I decided to paint a stack of books since this was an image Guston painted over and over again, plus it is a nice play on my last name. Well, the direct thing didn't work out though this was record time for me at around one month to produce. I had already begun work on a couple of other paintings but I realized that I was being drawn to the background as much as to the pile of books. This was more obvious in the next couple of paintings where there is only a single object depicted. I am intrigued by having this celebration of everyday battle and perhaps lose to the empty background. This is more pronounced in the work that follows.